Take that, Gawker Media video lads! The rest of the world (well, except for that grumpy Clive Barnes at the NY Post) agrees with us: Xanadu: The Musical is a hit on wheels. What the critics had to say, after the jump. Can a musical be simultaneously indefensible and irresistible? Why, yes it can....Why, you may wonder, would anyone deem it necessary, or even worthwhile, to pay lavish mock homage to a dreadful movie by exhuming it for exhibition onstage? Has Broadway nothing better to do? Has the American musical theater reached such a nadir of inspiration? Well, yeah. I guess. Whatever. Why pester me with silly questions when there's so much silly bliss to be had at the Helen Hayes Theater, where the new, improved "Xanadu" opened last night....The show's winking attitude toward its own aesthetic abjectness can be summed up thus: If you can't beat 'em, slap on some roller skates and join 'em. Huzzah, as the muses from Mount Olympus apparently like to say. [Xanadu]...is a grand little piece of smart dumb fun....Kerry Butler brings a devilish edge to the romantic absurdities of Kira, the nymph in '80s leg warmers who attempts Newton-John's Australian accent, when she feels like it...[and] Jackie Hoffman and Mary Testa, two of the theater's prime scenery-stealing comics, are let loose to do their best damage as weird-sister sirens - think Cinderella's evil stepsisters in goddess polyester (wittily ridiculous costumes by David Zinn) singing "Evil Woman." "The theater? They'll just take some stinkeroo movie ... throw it on a stage, and call it a show." I wish I could take credit for that astute bit of analysis when it comes to "Xanadu," the new Broadway musical adaptation of the cult favorite 1980 stinkeroo film, but it comes directly from the show itself....Unfortunately, such self-consciousness is not likely to increase your enjoyment of this slipshod enterprise, which belongs more in a fringe festival than on Broadway. Despite running a mere 90 minutes, it quickly proves wearisome in its one-note camp attitude. If you need a cure for the summertime blues or just like the idea of being in stitches for an hour and a half, "Xanadu," now at the Helen Hayes Theatre, will (Xana)do the trick. 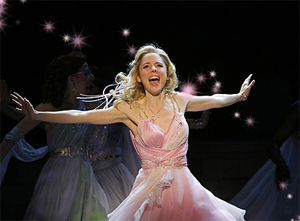 Kerry Butler...is simply out of this world as Kira. She has gorgeous pipes, great comic flair and puts on a fab faux Aussie accent that could make dingoes howl for more....In this story of a muse, the moment is eye and ear candy that's delightfully inspired. Ms. Butler's near-perfect...approximation of her predecessor [Olivia Newton-John] is viciously adept: She somehow stuffs every single vowel into the word "go," thins out her redoubtable voice to replicate Ms. Newton-John's watery upper register, and conveys a singular unease whenever on her ubiquitous roller skates. Both in on the joke and completely in tune with Kira's burgeoning humanity, Ms. Butler pushes past the leg warmers and wooden dance moves to unveil a real character. This is the best Broadway musical to feature roller-skating since Andrew Lloyd Webber's "Starlight Express" - but as it is also the only musical to feature roller-skating since "Starlight Express," that's no great commendation.... If you are of a certain age, you will remember that you had forgotten [the ELO music] and prepare to forget it again. That, I suppose, is the only goodish news of an absolutely ghastly show.